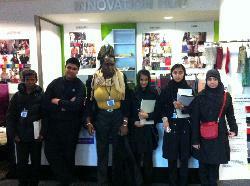 Students from three Mosaic supported schools were invited spend time with Marks and Spencer in London. Twelve lucky students from Crest Boys Academy, Southfields Community College and Westminster Academy had an opportunity to participate in a series of informative and fun sessions themed around how a product moves from being a design concept to the sales floor. The students were given an opportunity to work in groups with the Women’s wear knitwear design team and the Head of Design for Menswear and learn about what drives the trends and where the designers look for inspiration. They heard about how fabrics and colours contribute to the design and style of clothes. The students were amazed to learn that the fashions that were wearing today were decided about 18 months ago. They had an opportunity to hear about how M&S finds overseas suppliers in countries such as China, India, Sri Lanka and Bangladesh and were able to take part in creating their own ranges using a design brief and a rail of clothes. The students also heard about the history of M&S and visited the Boardroom before leaving to visit one of M&S stores based in Edgware Road. Here they were shown how a store works from the sales floor to behind the scenes. This included access to new initiatives such as “Style Online”, a trip around the new Food concept and the main storage areas including the freezer rooms and the CCTV room which they found fascinating. The students learnt a lot from their visit and had lots of fun on the day. Mosaic would like to thank everyone at Marks and Spencer that made the day possible and to our volunteers who supported the students on the day. Mosaic’s World of Work visits connect employers from a wide range of backgrounds and industries with young Muslims and their peers aged 11-25 years old and living in deprived areas of the UK. If you are interested in hosting a Work or Work visit for our students and would like to see our information pack, see our Get Involved pages.